Logicative has not been paid or even asked to write this review of Paprika, the opinions and statements made below are that of Logicative. This is a review of the iPhone app for Paprika, however, the Android, iPad, Mac and PC apps have also been tested and work fantastically in sync with each other. I would thoroughly recommend using the iPhone app for the grocery shopping, iPad for cooking, and Mac/PC for recipe entry although each is great independently without a requirement for the other. As well as a passionate web developer and self-declared geek, in my spare time, I do have a love of cooking. So, of course, I can’t think of much better than a great piece of software that will make my cooking and shopping life even easier! After trialling a few different ones I came across the Paprika Recipe Manager and gave it a chance. Best decision ever. As a developer that loves a good UX and interface that you don’t have to spend forever trying to figure out, it was a breath of fresh air to find an app that was not only incredibly usable but also looked really really good. 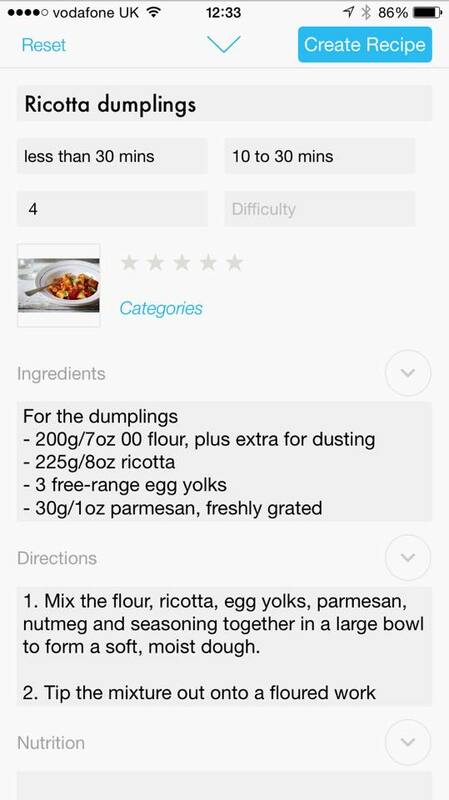 There are a few different ways of adding recipes to the app. The first and most time consuming is writing up a recipe from scratch manually. It couldn’t be easier though with the main recipe screen having a ‘+’ sign at the top right which once pressed directs you straight to the new recipe form. At this point you just work through each section and fill in the recipe details or as many of them as you want to add to the app. The form is neatly divided into three sections navigable by the buttons at the bottom of the screen – info, ingredients and directions – which prevents endless scrolling up and down the page. Once completed, press save and you are done. The second way to add recipes is by going into the menu and selecting the browser option. This then allows you to select from one of many predefined ‘Recommended Sites’ or search a specific website URL that has your recipe on it. 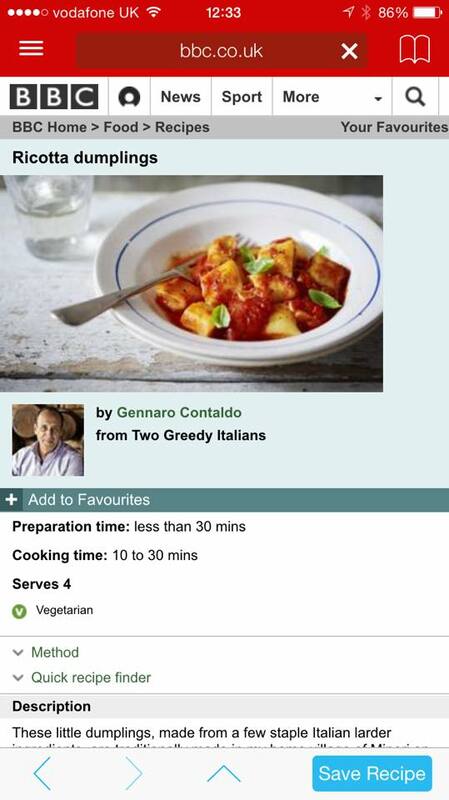 Once you are on the recipe page online there is an option at the bottom of the screen to ‘Save Recipe’ at which point you can save the recipe directly from the site, customise it and save it to your app! Once you have created recipes you can then share them with other people whether they own paprika or not! Once you have clicked on a recipe you want to share you click on the share icon at the bottom of the screen and select the email option. You can then sent that recipe to any email address and the recipe will be sent within the email for those without the Paprika app to see and use to their own requirements and also with a Paprika App attachment that when clicked can be opened in the recipients Paprika App and saved to their own collection. Cons: Frustratingly a feature of the ‘share’ facility is that the categories selected for the recipe to belong to in the original collection carry over to the recipient’s collection and, if the categories are not present on the recipient’s app it will automatically create them. 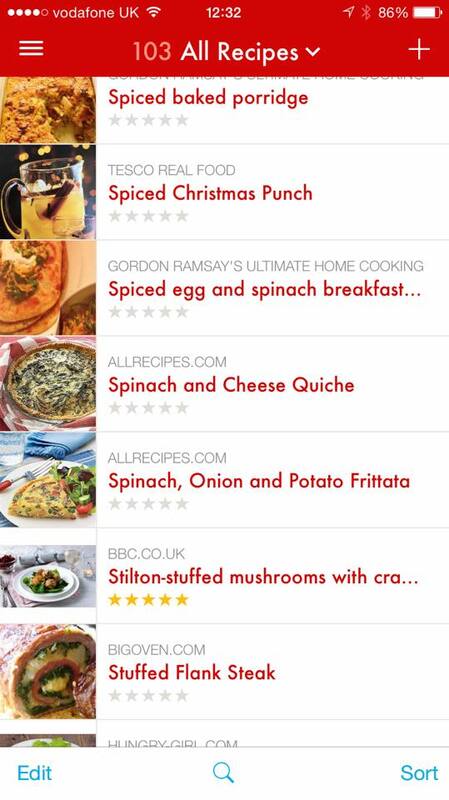 This can be frustrating if you have your categories carefully set up and then receive a load of recipes and with them a whole lot of new categories you never wanted! 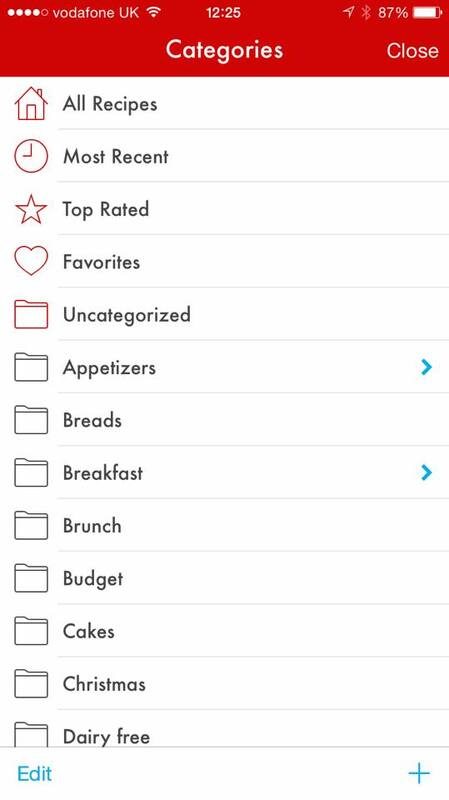 Adding categories is a large feature of the Paprika App. Any recipe can be added to multiple categories when the recipe is created or edited and categories can be managed from the recipe editor or the category manager. To add categories using the recipe editor, when selecting a category for the recipe to belong to, use the ‘+’ sign at the top right of the category selector to add a new category to the list. To view all categories and manage them from the main recipe screen, select the ‘All Recipes’ drop down from the top of the page and a list of all the categories will be displayed for you to select to search recipes by specific categories or editing or adding new ones with the options at the bottom of the screen. There is also no limit to the hierarchy that I have found yet and so you can have multiple subcategories. A really useful tool for the app is the ‘Grocery List’ where you can select the shopping trolley icon at the top of any recipe and can add all, or a custom selection of, the ingredients to your grocery list. By navigating to the ‘Groceries’ tab in the navigation, all ingredients added to the grocery list will then have been separated into the sections you will find them in in the supermarket, grouped together where the items are the same for multiple recipes, and have checkboxes to tick off the items as you buy them! Saves so much time and energy and is fantastic for both online and in-store shopping as well as helping to avoid overspending on shelf browsing as you go around the shops. It also takes into account whether you have scaled the recipe (see ‘Using while cooking’) and only adds the ingredients you need into the grocery list. Using the menu planner you can also plan all your meals in an inbuilt calendar to plan what you will be eating and when. Clearly laid out this makes shopping and budgeting so much easier. 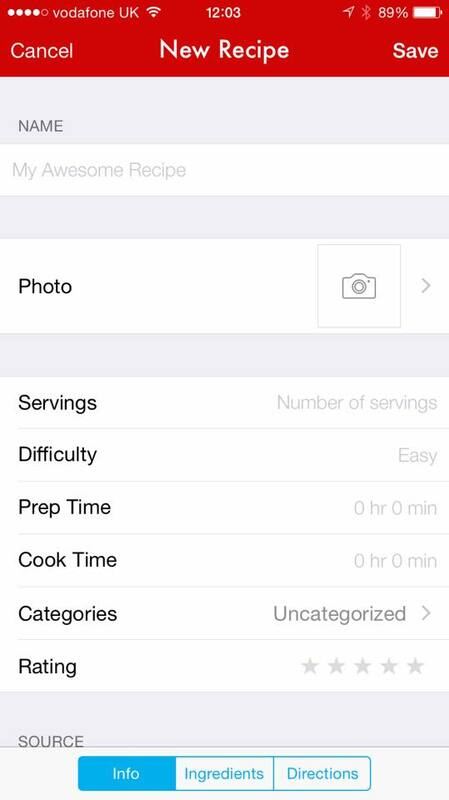 There are several features of the app that seem really simple but are of huge help when preparing a meal. Timer: Anytime within the instructions for the recipe that a time is mentioned (e.g. 2 minutes) the app will allow you to set an in-app timer by just clicking on this time. At any one time, you can have multiple timers going that are available from the footer of any recipe for quick viewing which is each labelled with the name of the associated recipe. Scaling: You can scale any of the recipes to change the servings to whatever is required for the meal you are preparing. Once scaled the ingredients will automatically update and the updated measurements are then what is added to the grocery list if selected. 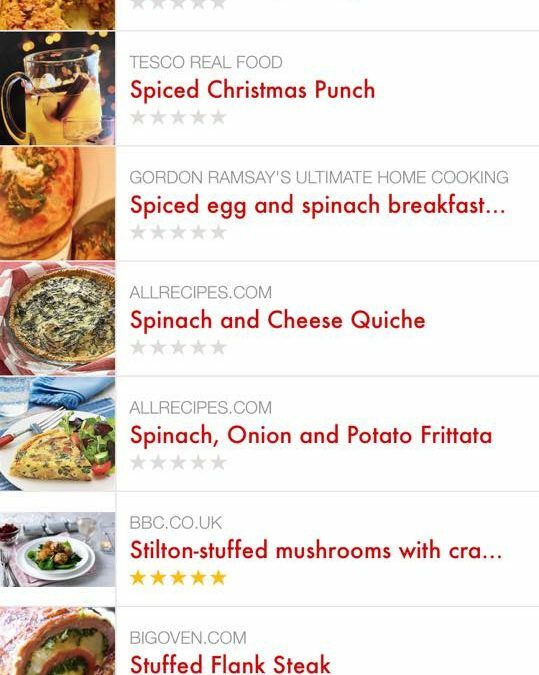 Pinned recipes: You can pin multiple recipes to make them available for quick viewing in the footer of any recipe on the app. Highlighting: Tapping the current step of the recipe will highlight it in a light grey colour that makes it easier to find where you are in a recipe and keep track of progress.